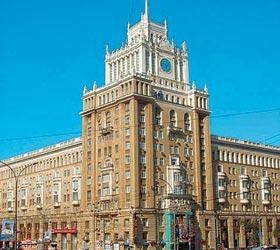 The Peking Hotel is a three-star historic hotel, near the Moscow Zoo and the Hermitage Garden, and close to Pushkin Square. The rooms are decorated in a traditional style. There are two hotel restaurants, and a limited amount of meeting space. The amenities include a restaurant and a nightclub. The Sheremetyevo Airport is about 15 miles away; the Vnukovo airport is a similar distance.